Fairview Cemetery at Colorado Springs is located on the west side of the city at 1000 S. 26th Street. To reach the cemetery, take Highway 24 west and turn south onto 26th Street. Proceed five blocks and the cemetery is located on the west side of the street. According to GPS-derived geolocation (accurate to within 10 meters), the cemetery's coordinates are 38°50'27.8"N and 104°52'20.2"W. The city of Colorado Springs maintains both the records and grounds of the cemetery. The hours of the cemetery from April 15 to October 15 are 6 a.m. to 8 p.m. daily. Between October 15 and April 15 the hours are 7 a.m. to 6 p.m. The cemetery is nestled in the rolling foothills that form the eastern slope of Pikes Peak. This picturesque Rocky Mountain location offers a beautiful view of Cheyenne Mountain to the south and Garden of the Gods to the north. The grounds are well maintained and contain many mature trees. For the purposes of this index, the layout consists of 27 blocks numbered 1 - 21 and 1A - 6A. However, please note that Blocks 1A through 6A are officially designated by Fairview Cemetery as Block 1, Addition 1, through Block 6, Addition 1. No standard layout for burial plots has been used throughout the cemetery. This has created a complex mix of numbering systems to locate a specific burial location. Some areas use a block, lot, and plot system while others are designated with block and plot. Some of the plots are designated with directional locations (NE, EC, SE, SW, WC, NW), while others simply use a single plot number. To complicate this issue, most blocks use a combination of both systems. As a result, the intent of the maps included in this book is only to help researchers obtain a general location of an individual tombstone. If visiting the cemetery, you can obtain more detailed information at the cemetery office during normal business hours Monday through Friday. 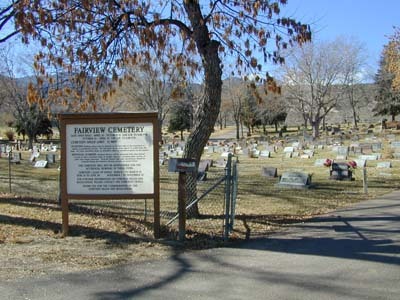 Fairview Cemetery was founded in 1895 when Colorado City (then adjacent to Colorado Springs) purchased land from Anthony Botts, a local pioneer. The original area of nearly 32 acres was deeded to Colorado City on June 8, 1896. Additions covering about 18 city blocks were obtained in 1908. The first recorded burial at the cemetery was October 17, 1895; burials prior to this date do not have sexton records. Between 1895 and 1917, when the city of Colorado Springs took over the cemetery's operation, there were only 46 burials. By 1996 more than 6,000 burials had been recorded. Fairview features several imposing headstones and monuments, and many have photos of the deceased cemented to the stone. These are attractive, but are often subject to vandalism. The grave sites include many individuals who were a part of the history of the West: prominent members of the community, prospectors, saloon keepers, madams, and average citizens. In 2006, the City of Colorado Springs posted online this index to the city-owned cemeteries of Evergreen and Fairview: City of Colorado Springs Cemetery Indexes. Reportedly, it will be kept up to date, but be aware that it's not without error or omission.